Obituary – Beard, Melvin Matthew « Perry High School Alumni Association, Inc.
Pvt. Melvin Matthew Beard was killed in action on Saipan island July 11, 1944. 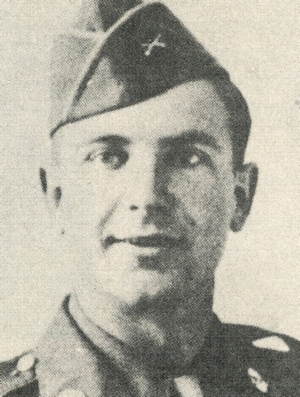 Pvt Beard was serving with an infantry unit at the time of his death and had been overseas less than six months. Following his entry into service July 13, 1943, Pvt. Beard was sent to Fort Sill and from there he was sent to Camp Roberts, Calif. for his basic training. From Camp Roberts he was shipped over seas. Pvt. Beard, the son of Mr. and Mrs. Roy H. Beard, was born in Red Rock February 11, 1924. He attended school in Arkansas, Missouri, New Mexico and at Ponca City. He graduated from Perry highschool May 19, 1943. Before his graduation, Pvt. Beard was employed at the Conoco service station here and did janitor work at the highschool building. He was affiliated with the First Baptist church and was a Perry highschool FFA member. In addition to his parents, Pvt. Beard is survived by one sister, Eula May Beard, who resides with her parents.